← Blackbeard’s Seafood Island: Boodle Feast Food Attack! Despite the earlier trip, December had me back in Singapore. Ready to do all the food things I missed out on in October (find Bickford’s Sarsaparilla, eat at Din Tai Fung), I found it a bit funny that my first meal was at Mc Donald’s. Manila’s Mc Chicken cannot hold a candle to this yummy sammy. And yes, McD’s Philippines, don’t think I didn’t notice that your chicken patties are waaaaay smaller now. Yes, after basking mostly in Singaporean food during my previous trips, I actually found myself in a fastfood chain that’s all over Manila. Of course, after biting into their Spicy Chicken Sandwich, I readily ate my words. It was yummy! 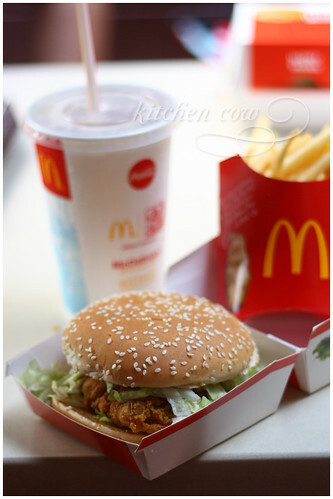 Flavorful, crisp on the outside, juicy on the inside—why can’t McD’s here do fastfood sandwiches as good as this? 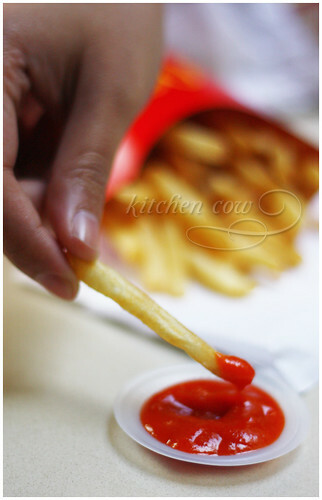 A fry dipped in the chili-garlic sauce, as modeled by my “professional hand model” friend. I also found it interesting that aside from the usual ketchup dispensers, they had a dispenser for chili-garlic sauce as well. A bit redder than the usual tomato ketchup, their spicy sauce packed a wallop. If that’s not enough, they also distributed packets of nori flavoring, a powder you can sprinkle over your fries for added flavor. Both were quite good. It definitely shakes up the usual french fry-tomato dynamic. We were greeted by a large number of waiting people outside Taiwanese restaurant chain Din Tai Fung, all waiting to grab a table for dinner. Determined to eat their Xiao Long Pao, we took a number, placed our order, then caught up with each others’ lives as we waited. A gajillion stories later, our table was finally ready. Thankfully, we didn’t have to wait long for our food. 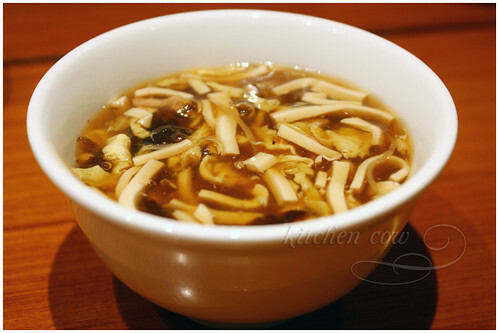 A large bowl of Hot and Sour soup was served almost immediately. Chunky, gooey, steamy hot and sour goodness. Good way to start the meal. The Rabbit does not lie. Prawn Pancakes score two rabbit ears up. 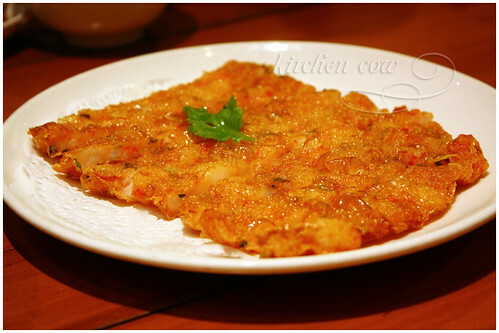 After that, they brought out a plate of what my friend Rabbit identified as her newest addiction, Prawn Pancake. Now Rabbit is addicted to anything shrimp, so I thought it was just her shrimp love acting up. It wasn’t much to look at, but biting into the pancake was a pleasant surprise. Crisp on the outside, moist, flavorful, firm and fleshy on the inside. It mimics the feeling of biting into whole shrimp, rather than minced ones as shrimp cakes tend to feel like. Pork Chops! On rice! Can’t go wrong with that. In the ancient times, Xiao Long Pao was an assassination tool, given as innocent gifts to warring tribes. One bite and the soup spurts, burning the enemy’s mouth. Xiao Long Pao! A very interesting dumpling filled with meat and soup, it never fails to fascinate because, well, it’s filled with soup. SOUP! In a dumpling! It’s a very novel experience, biting into resilient, stretchy dough and being rewarded with a tasty soup. And occasionally, a burnt tongue if you’re too eager. Try it with the black vinegar and ginger for added layers of flavor. The Rabbit likes her shrimp. And yes, I agree. The shrimp version is really really pretty. As if the Xiao Long Pao wasn’t enough, we had to get Xiao Long Pao with shrimp too. It’s yummy too, but I prefer the plain one because it’s easier to eat. 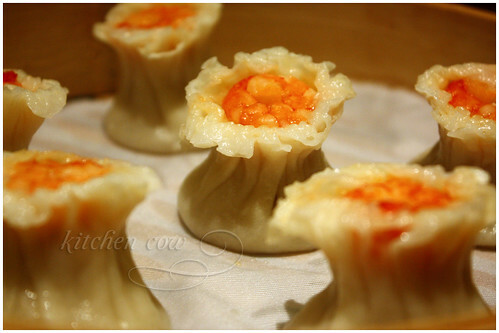 Besides, I’m happily content with the soup inside the dumpling so no need for extras, even if it is shrimp. But I imagine shrimp lovers will not have it any other way. 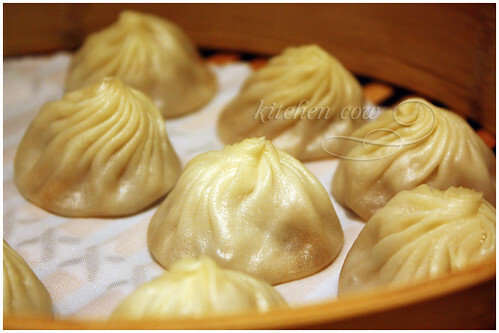 Was Din Tai Fung worth the way? If only for the Xiao Long Pao, yes. The food is generally good but I can eat trays of the lovely soup dumplings all day long. Soup has never been this fascinating. Nor dangerous. Food Court Hopping, Magical Turkish Ice Cream, Ginger Beer and Takoyaki! This entry was posted in food spotlight, food trips, restos & eateries and tagged bah kuh teh, balestier, bickford, bickford ginger beer, bickford sarsaparilla, clark quay, climado, clmado, din tai fung, food, food hall, food opera, food republic, french fries, hainanese chicken, hawkers, ion, magic, mc donalds, porkchop rice, singapore, spicy chicken sandwich, turkish ice cream, xiao long pao, xiaolongbao. Bookmark the permalink. spicy chicken sandwich is my fave too 😀 btw, great shots! The shrimp version looks really pretty and yummy! When do I get to go with you to eat all these food?!? Surely you’ll need help! I want to learn to take nice food photos as well! Parang alien talaga yung Shrimp Xiao Long Pao! Pang… anime. My mouth is watering from this post!!! AAAAAAAAAAAAAAAAAAAHHHH~~~!!! ION’S TAKOYAKI! *A*) MOST GLORIOUS!! I demolished a whole steamer of xiao long bao in Din tai fung in Beijing over the new year, no burnt tongue to show for it, but delicious. Unfortunately, it’s hard to find good xlb in China sometimes. 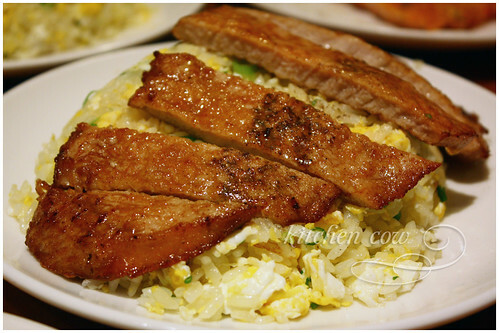 A friend also introduced me to their pork chop (no rice with ours, but soooooo tasty). wow that prawn pancake looks crispy and delicious!!! Agree with you so much! But it has to be as good as the one in SG. I want some now. I’ve been craving madly these past few days. May Xiao Long Pao sa Spiral buffet but you have to wait 15 minutes. By the time it was ready, busog na ako. You and me both! The pitfalls of food blogging. You remember what you eat…after it’s gone. And to think I almost missed it. Thank goodness Cla reminded me. Wow, authentic! I’d love to do that too, enjoy a steamer for myself. Kahit hindi Beijing—even some from Eatwell would make me happy. Oooooh it was. I actually ate more than I should (I monitor my shellfish intake). But it was all good. Din Tai Fung! is love! They always have ridiculous waiting lines but so worth it. Ive eaten na in their Taipei and HK restos. Good to know they have one in SG! For a good reason, Din Tai Fung’s food is really yummy.